In a routine check you may have discovered that your database is growing too fast. With further investigation you may have found out that GFI MailArchiver is also archiving unwanted spam emails. b) how you can easily remove archived spam emails from all other GFI MailArchiver Archive Stores. 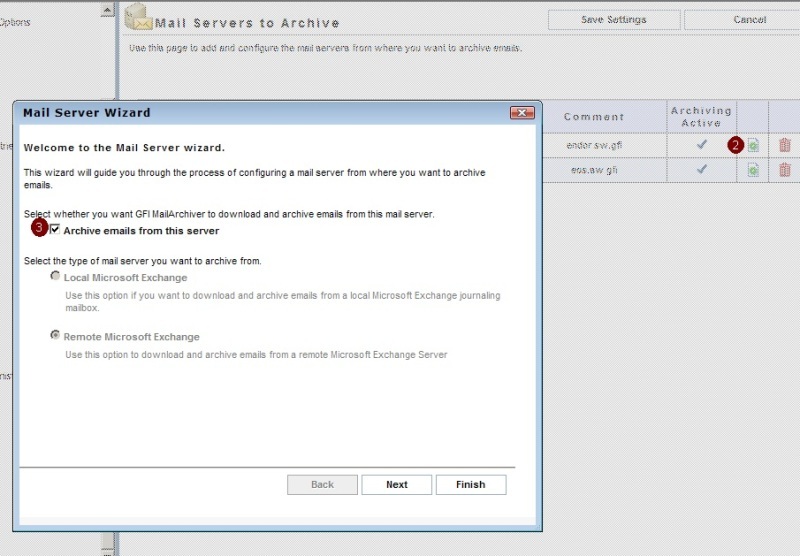 In the first step I will temporarily disable the current “mail servers to archive” process which is maintained by GFI MailArchiver. New emails will therefore remain (for a short interruption time) in the journaling mailbox of the Microsoft Exchange Server. For this I will log on to the GFI MailArchiver machine as a domain administrator. Then I will open the GFI MailArchiver Administration Configuration Console. From this screenshot you can see that I have configured two journaling mailboxes on two different Microsoft Exchange Servers. We will launch the “Mail Server Wizard” for each journaling mailbox that we want to disable. As you can see in the next screenshot, click on the icon “edit mail server settings” (2) and choose to enable/disable the option “Archive emails from this server” (3). We will disable the option and confirm the changes (“Finish” button). From now on no further emails will be downloaded from the journaling mailbox by GFI MailArchiver. 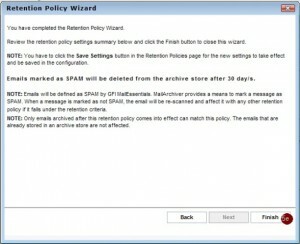 In the next step we will create a SPAM retention policy in GFI MailArchiver. This should help us to prevent GFI MailArchiver from archiving further spam emails in the archive store. If I use GFI MailEssentials in the latest build as an Anti-Spam solution which should filter inbound spam emails, then GFI MailEssentials will automatically mark the spam email with a specific spam tag in the header. GFI MailArchiver will now be able to make a difference between a HAM and a SPAM email by just looking into the header of an email that should be archived. 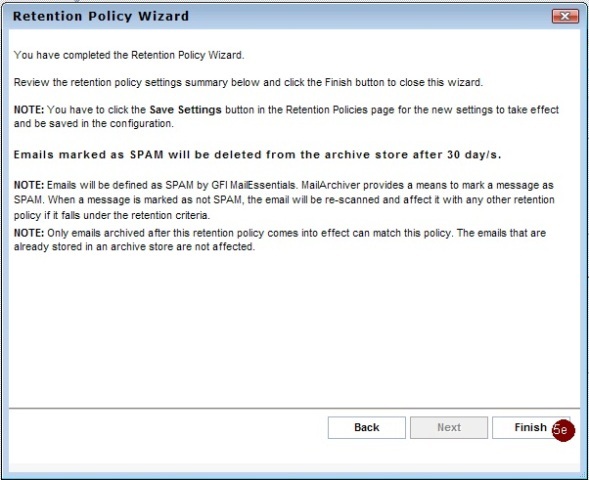 By choosing the option “Add Spam Retention Policy” (5) I will determine that GFI MailArchiver will not archive any further emails into the GFI MailArchiver Archive Store which have been marked as SPAM by GFI MailEssentials. In my case I will select the option (5). 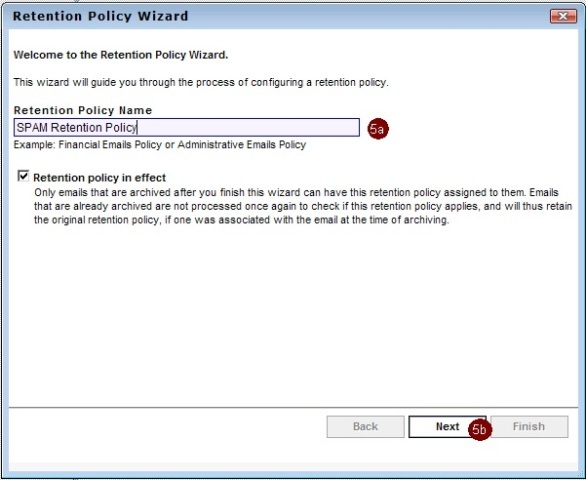 In the first form of the “Retention Policy Wizard” I will provide a proper name for the Spam Retention Policy (5a) and confirm the name of the Spam Retention Policy (‘Next’ button) (5b). 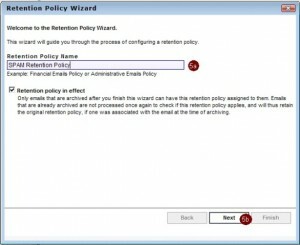 In the next form of the “Retention Policy Wizard” I need to determine the Retention Policy Action which means that spam emails should be deleted by GFI MailArchiver immediately or after X days (5c). Per default GFI MailArchiver will suggest 30 days. After selecting the right option I confirm the selection (‘Next’ button). We have now set up a Spam Retention Policy which takes immediate affect on all new emails which GFI MailArchiver should archive. Emails which have been marked as spam will not be archived in the GFI MailArchiver Archive Store or will be removed after X days from the GFI MailArchiver Archive Store. How can we deal with “false positives” – the HAM mail erroneously marked as SPAM? Are there any techniques to archive such e-mails by the end-users? HAM email from the GFI MailArchiver Archive Store. in the spam retention policy in GFI MailArchiver. feel free to open a legitimate support request on our website.